Thank you for your support during this difficult time. Please enhance this tribute to Shirley by adding your memories and photos. 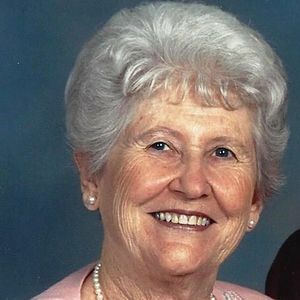 Shirley Kerns Fogle, 82, of Charleston, South Carolina, wife of John Buck Fogle entered into eternal LIFE Sunday, March 10, 2019. The family will receive friends Wednesday, March 13, 2019 in J. HENRY STUHR INC., WEST ASHLEY CHAPEL, 3360 Glenn McConnell Parkway from 5:00 p.m. to 7:00 p.m. Her Funeral Service will be held Thursday, March 14, 2019 in Charleston Baptist Church, 13 San Miguel Road at 11:00 a.m. Interment will follow in Live Oak Memorial Gardens. Shirley was born September 29, 1936 in Florence, South Carolina, daughter of the late Ernest Mauney Kerns and Ada Nellie Stephens Kerns. She was an executive tax preparer with H and R Block. Shirley was a member of Charleston Baptist Church. She is survived by her husband of 62 years, John Buck Fogle of Charleston, SC; daughter, Susan L. Hoskins and husband Ed of Charleston, SC; son, David Allen Fogle and wife Barbara of Summerville, SC; five grandchildren, Kenneth Langley (Christina), Erica N. Hoskins, Anna Wells (Tommy), Justin Fogle (Laura), and Jonathan Fogle; seven great-grandchildren, Kepler and Oliver Langley, Jilliann and Kasey Wells, Aydan, Anleigh and Liam Fogle. The family would like to say a Special Thanks to Amedisys Hospice providers, Katheryn, Sabrina, Angela, James and also to We Care Home Care, Ruby, Shavonda and Vivian. In lieu of flowers, memorials may be made to Charleston Baptist Church, 13 San Miguel Road, Charleston, SC, 29407 . May your family find peace knowing that you are in a better place with the Lord. So sorry to hear of Shirley's passing. She was such a sweet lady. Diane Chard. She was always so very kind to me when I went to church with her. She will be missed Condolences to family. My condolences to John and his family. Praying for family and the loss of your family. I will miss her sweet gentle spirit and her laugh. She was a special person and a gracious lady. She loved her children Susan and David and their spouses and children and great grand children. Family was everything to her. You will miss her and I pray for you. I will miss the times we shared. We have the promise that we will see her again. So sorry to hear this. I worked with Shirley at West Ashley office of H&R Block back in the 80's. Life Stories provides friends and families a forum to post their favorite stories and memories of Shirley Kerns Fogle ensuring the precious experiences are never forgotten. Share joyful times, post a photo that captures the moments you cherish, and allow others to reply, relive and remember.